Allergy to pollen affects many people of all ages. There is a prevalence among adolescents and young adults, however, children as young as 2 have consulted an allergy specialist. Also, patients as old 75 without any past history of allergy have experienced hay fever symptoms. Pollen is released by plants into the atmosphere to allow fertilisation. 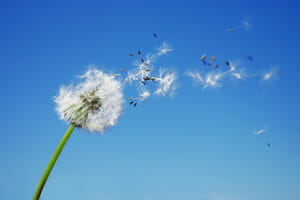 For pollens to cause an allergic reaction they must be small particles, in large amounts, have a strong allergenic component and be easily transported in the wind, and can travel up to several hundreds of miles. Pollens transported by insects, is called entomophilous and plays a secondary role in triggering allergies. Rhinitis (runny nose) predominantly affects patients with hay fever, usually the same symptoms at the same time each year: itchy nose, violent repetitive sneezes, persistent runny discharging nose and a blocked nose. Watery, itchy, red eye symptoms, very often accompany allergic rhinitis. Itchy mouth, nose and even ears are experienced. Hay fever sufferers commonly have asthma symptoms. Tree pollens, in particular 'birch' are problematic and cause a high pollen count. It is becoming apparent that more people that have never experienced an allergic reaction are now doing so and presenting with sneezing and coughing episodes. As many as 1 in 2 hay fever sufferers experience episodes of coughing, breathlessness and wheezing. These symptoms are characteristic of asthma, however, patients do not always realise that these are symptoms of asthma and do not seek help or treatment. Hay fever is frequently accompanied by periods of exhaustion. People are debilitated in their daily life both at work and at home. Sleep is commonly affected, and the enjoyment of being outdoors is removed, often feeling restricted for 2 to 3 months of the year. It is important to see your GP and get the appropriate treatment so that a normal life can be resumed and enjoyed. Symptoms left untreated can also have consequences especially where asthma symptoms are concerned. Various types of pollens are released each in turn in the atmosphere from January to October. Cypresses, plane trees and birch are the trees, which cause the most allergic symptoms. Cypress pollens cause a so-called green pollution. Trees such as the birch, the poplar and ash are responsible for many pollens. 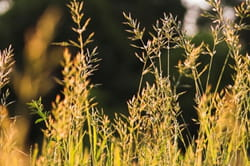 Grass pollens, traditionally called "hay fever" are where the grasses pollinate. It lasts approximately two months. Grasses grow everywhere, in meadows, ditches, in forests, on roadsides, gardens, in the countryside but also in the cities. In other countries where there are mountains there is a later pollen season. The pollen count is at its highest in July and August after the ice and snow has melted. Sufferers are best to avoid taking a holiday here at this time..
Graminaceous fodder: dactyl, phleum, ryegrass, meadow grass, fescue, couch grass. Graminaceous cereal: wheat, corn, barley, oat, rye. Even later, from the end of summer to October herbaceous plants, which there approximately 50.000 species, spread out in towns, on the edge of the roads or on paths. Ragweed, is the most well known one and proliferates at the end of August and beginning of September. It causes very debilitating episodes of allergic rhinitis and asthma. The presence of significant amounts of allergic pollens in an area can cause a biological form of pollution, still called green pollution. Some pollens, like cypress and ragweed, cause symptoms not only in people with an atopic (allergic) background, but based on a threshold of toxicity, the concentration of pollen grains in the atmosphere affect many non allergic people. Not so much in the UK, but on the Mediterranean, Cypress trees are planted in large amounts as hedges as they are easy to grow and inexpensive to buy. As a result they impact greatly on those sufferers. Its pollens are very volatile and can spread over more than 150 kilometers. It develops on empty and badly maintained grounds, on building sites, roadsides like fallow grounds. How to avoid the ragweed proliferation? Uprooting and mowing must be done before the blossoming date, usually in July. Establishing a fallow land could avoid grass proliferating. The intensity of pollination varies from year to year according to meteorological conditions and the local area. Heat and moisture increase the concentrations of pollens. Cold, dryness, or heavy rains decrease them. The sun and wind disseminate pollen grains. The development of pollen allergies over the last thirty years has been parallel to an increase in chemical pollution. Urban pollution worsens the toxicity of pollens by weakening the surface structure of the grains and by allowing the release of allergen proteins. Pollutants are also irritating factors which cause an increase in the bronchial, nasal and ocular hyper-responsiveness. Experts agree that milder winters and hotter summers have lengthened and intensified the hay fever season. In certain cases, people allergic to pollens may have an itchy mouth, and even an oedema from eating certain fruits and raw vegetables: it is a cross-allergy between food and pollens. For example a patient allergic to birch pollen will not be able to eat apples because of a terrible mouth and throat itching. POLLENS Of ALDERS: peach, hazel nut, cherries, almond, parsley, apples, pears. It may be necessary to consult with an allergy specialist before eating some of these fruits as there is risk of a severe allergic reaction. Rinse your hair in the evening before going to bed in order to avoid the pollens which have accumulated throughout the day settling on pillows and causing allergic symptoms. Wear sunglasses and a hat when outside. It is advisable for students with a pollen allergy to see their GP before sitting exams. Good planning and management is crucial to avoid debilitating symptoms. Latest update on April 2, 2013 at 06:13 PM by Marjorie Gaulier. This document, titled "Allergy to pollen," is available under the Creative Commons license. Any copy, reuse, or modification of the content should be sufficiently credited to CCM Health (health.ccm.net).